Littleroot is a small village located in southern Hoenn. At the start, you will pick your name and gender and arrive in a moving truck outside your new house. Girls live in the house on the right; boys live in the left one. Once you enter your home, your mother will ask you to set your clock in your room upstairs; the time you enter will affect several events in the game. You can read the manual next to the PC if you wish; it explains how to save your game. You can withdraw a Potion from your PC. After doing this, head back downstairs. Your mom will be watching TV. She quickly calls you to watch the TV, saying that your dad might be on TV. However, the program ends. Your mom will continue to talk, and you learn that your father is the Gym Leader of the Petalburg City Gym. Your mom then suggests that you go and meet your neighbors. 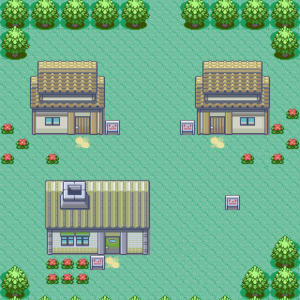 In Ruby and Sapphire, travel to your rival's house next door to meet him/her. Go over to them and talk to them to introduce yourself. In Emerald, when you try to touch the item ball in their room, May/Brendan will appear and talk a little about what they want to do as a Trainer, and that Professor Birch is their father, before leaving. After a brief introduction, head over towards Route 101. Here, you will meet Professor Birch being chased by a wild Pokémon. His bag has fallen nearby. Click and open it to find three Pokémon - Treecko, Torchic and Mudkip, in their Poké Balls. As with previous Pokemon versions, choosing the grass Pokemon (Treecko) is the easiest mode. Treecko is a pure grass Pokemon, a departure from the grass and poison combo of Bulbasaur and the only starter to remain a sole type through evolution. Mudkip is a pure water, although its later evolutions have a ground subtype. Choose Mudkip for an intermediate experience and one of the strongest evolved starters. Torchic is for advanced users, facing many early disadvantages, but grows into Blaziken, a fire and fighting combo. Select one of the three Pokémon and battle the wild level 2 Poochyena (Zigzagoon in Emerald). After the battle, Professor Birch will give you the Pokémon you chose as a gift. After you have your starter and talk with Professor Birch, it's time to head north again to Route 101. After you receive the Balance badge from Norman in Petalburg City, come back and visit your mom, who will reward you with an Amulet Coin, which doubles your winnings if the Pokemon holding it saw battle. 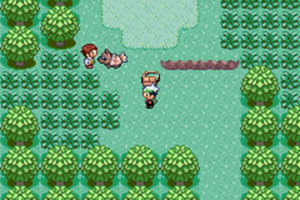 In Pokémon Emerald, Professor Birch hands the player one of the Johto starters after completing the regional Pokédex. Treecko is a grass-based Pokémon that remains a grass type throughout its three evolutions. While it is very strong against the first gym, there are many types that are super effective against grass, so you may encounter some difficulty throughout the game. Treecko gains a massive speed boost in its final evolution. Torchic is a fire-type Pokémon that gains the Fighting type when it evolves into Combusken later in the game. Fire-type Pokémon are strong against many other types making Torchic and his evolutions very useful throughout the game. However, it will be difficult to take on the first gym leader alone with Torchic, making the beginning of the game more difficult than the rest. Mudkip is the middle of the ground Pokémon in this game. It is a water-based Pokémon that will gain the Ground type upon evolution. Though its type will not be super effective versus many other types, it will at least be of normal effectiveness. Mudkip will be super-effective against three gym leaders and fairly good against the rest. This page was last edited on 24 November 2018, at 01:51. This page has been accessed 190,240 times.